About The Artist: What do you get when you mix four dads from Santa Cruz who play rockin’ kids music that inspire “toddler mosh pits” during every gig? Oren and the Hiccups! Oren began writing songs and playing them with his sons Jacob (now 5) and Emmet (now 2 1/2) and their friends. His living room became a testing ground for songs like Turn Around the Sun (a song about the planets) and Lady Ladle (a song where you can stick out your tongue). He received such positive responses from his children’s friends and their families that Oren decided to bring drummer Jamie Taylor, guitarist Shahir El Shaieb, and bassist Todd Ridgeway together to begin performing in local venues. They soon found themselves inside Greenote studios to record their debut CD “Turn Around the Sun.” Oren started writing rock music as a young child. He holds a doctorate in psychology and in all of his songs he incorporates current research about the way children learn through music. Jacob and Emmet help to invoke the playful and kooky nature of his music. “Nicka nicka” was a sound Jacob was making one day while playing. The groove of that sound inspired Nicka Nicka Neigh, a song about how the horse got its neigh and how the cow got its moo. Sir Cleany Dean is a tune about a guy who can’t figure out why his house is always so clean. The listener finds out that Cleany Dean’s cat sneaks into the broom closet each night and scrubs the house while Dean sleeps. This idea was sparked by a picture that Jacob painted of a cat with a broom. Shine Down on Me is a lullaby Oren wrote while watching baby Emmet sleeping. Oren’s target audience ranges from ages zero to six. Many of his young fans are sited around Santa Cruz County sporting “I’ve got the Hiccups” t-shirts. 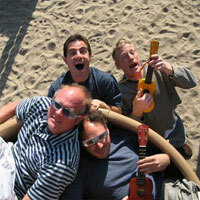 Hiccups songs are upbeat, lighthearted, and encourage movement. One of the most popular songs, Uh Oh is about falling down, something that toddlers do frequently. Oren sings “…and if I fall down I say ‘uh oh,’ I pick myself up, dust myself off, and then I’m on my way.” The Hiccups perform around Santa Cruz County. The band is dedicated to benefiting the local community. One organization they have played several benefit shows for is Jacob’s Heart Children’s Cancer Association. This organization is dedicated to improving the quality of life for children with cancer and easing the challenges faced by their families. Last year, the Hiccups were asked to perform for a local community television show, and now Hiccups performances regularly sell out at local Santa Cruz venues.